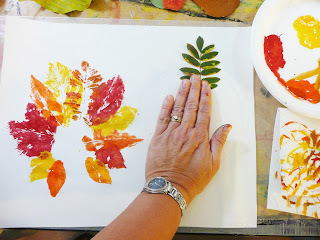 Looking for a quick and easy Thanksgiving project, why not try leaf print Turkeys. 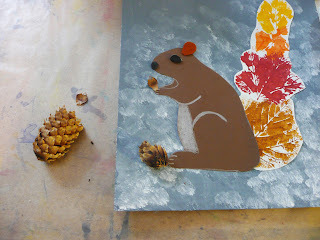 or maybe a Squirrel for those of you not celebrating Thanksgiving next Monday. I just love the acorn! And I can't wait to make this deer for the nature table. This week's feature book and giveaway is "How to Make Stuffed Animals" by Sian Keegan. Another great selection from my friends at Quarry Books. This book features large photos and full size patterns. (no enlarging!) All projects can be completed with "fat quarters" so you don't need alot of fabric kicking around. There are 18 projects in all and wait till you see the fox and the fluffy sheep. My kids have always enjoyed making stuffies. We started out with tiny animals using wool felt and embroidery floss. Here is my youngest at 6 sewing his frog. Great projects for you or your little sewer to try. Wouldn't these make great ornaments for a woodland themed Christmas tree? Check out the end of this post to enter the giveaway. Select your background. 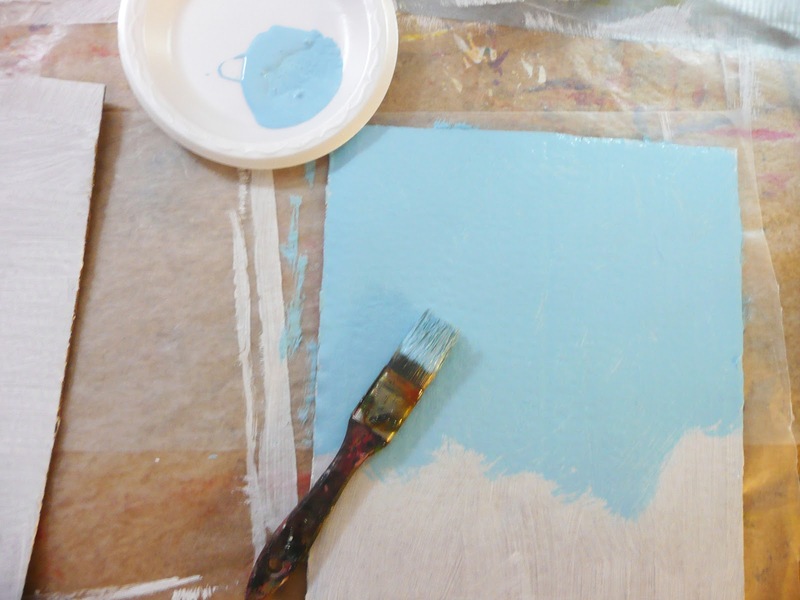 Now you can use cardboard that you have primed and painted, coloured posterboard, or even wc or heavy paper. 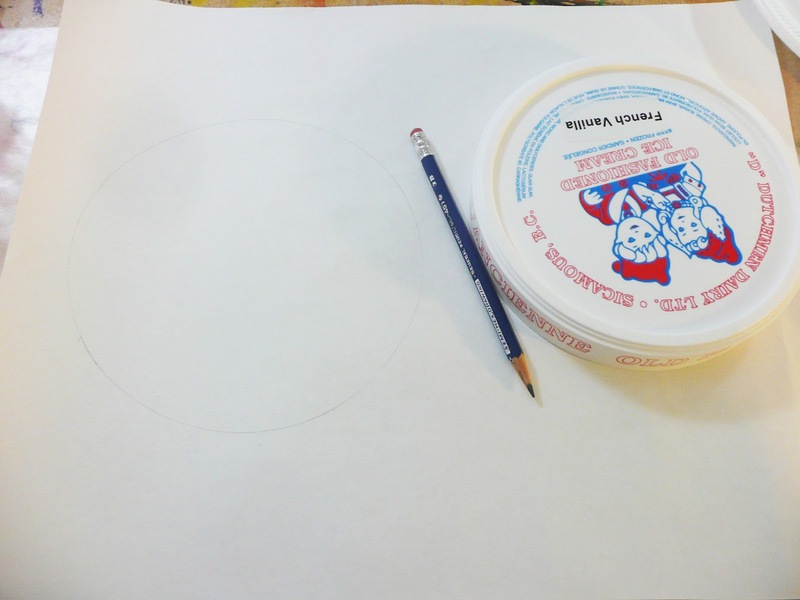 If you are making the turkey find a round object to trace around. This will be your guideline when making the feathers. Take your liquid tempera and paint the backside of a leaf. 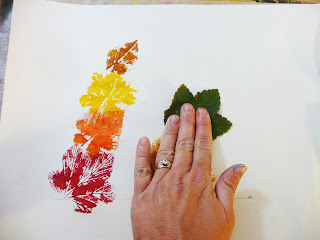 Following the circle you traced, lay the leaf paint side down and press. Vary the sizes, types and paint colour. For the squirrel make a stack from largest to smallest, you could even put a bit of a curve in it. When the prints have dried, cut out keeping that fan shape. 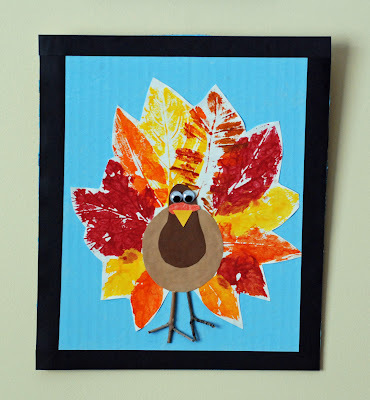 Cut out the extra parts of the turkey out of the coloured paper. 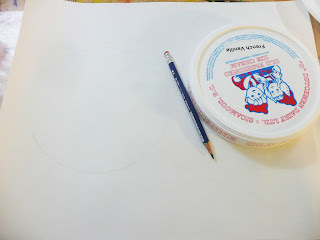 You need a circle of Kraft paper/paper bag. a long pear shape for the head, a triangle of yellow for the beak, and a squiggle of red. You can use my template if needed. Glue into place on your background. 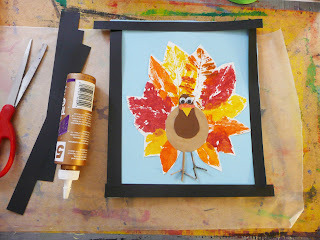 I used 2 googly eyes and 2 small twigs (for feet) to embellish my turkey. Lastly you can add some black paper strips glued down to form a nice frame. For the squirrel I glued down the tail first. I traced out my squirrel shape with a white pencil crayon on brown paper. (see template). I cut the shape out and added a few details with the white pencil crayon. 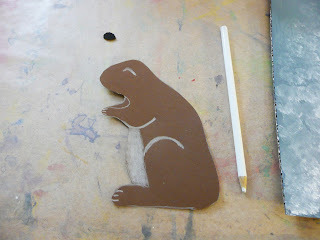 I then glued the squirrel body into place, added a brown felt ear, black felt nose and eye, and bits of a pine cone. Add the black paper strips to finish. That's it, a great Thanksgiving project. Please enter by 11:59pm on Thursday Oct 4th/12 and I will make the draw Friday Oct 5th/12. Only US and Canadian residents please. Good luck everyone and be sure to try some leaf print turkeys or squirrels. 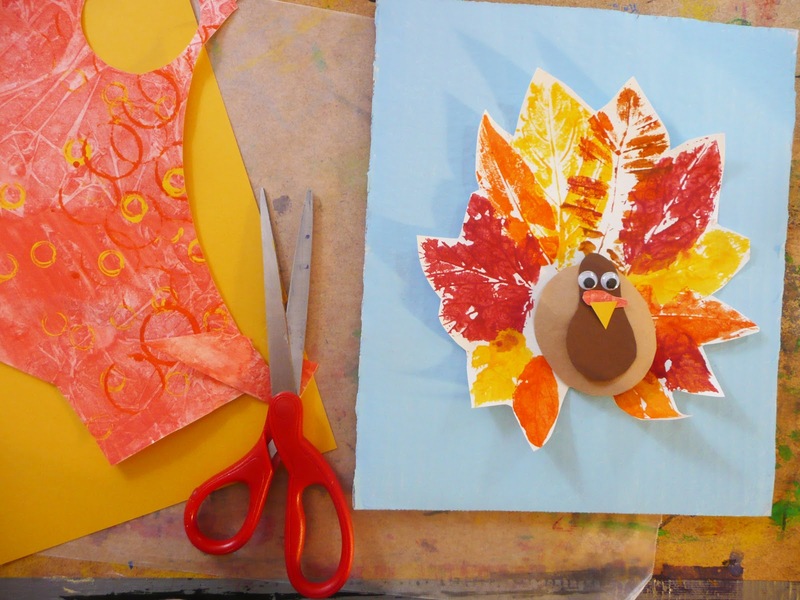 Great decorations for Thanksgiving! Disclaimer: Review copy of How to Make Stuffed Animals provided by Quarry Books. All opinions expressed are my own. I work as an educator at a children's museum and I LOVE your projects. I challenge myself to select ones that can be adapted for the youngest and oldest at heart, and that can be done in 15-minutes. Thank you for your wonderful ideas! ~ Using your squirrel idea today!! So cute!! Ooh! The book looks great! Love your artwork! What a great idea to make stuffies with the kids! Thanks for the ideas! Love the ideas! Would love to make some Xmas ornaments. Super post. Count me in the drawing for this book of cute stuffed animals. I am a pre-k teacher and I have used so many of your ideas with my students. 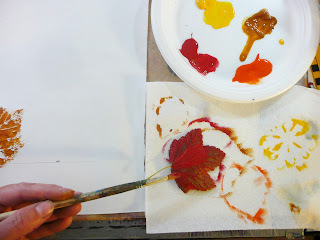 We are getting ready to do the fall trees by painting water color stripes and blow painting. The parents do not believe that 4 year olds made these. 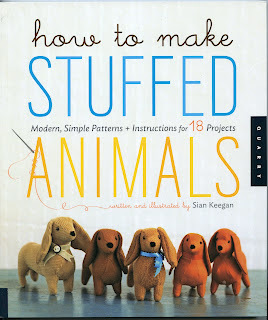 I would love to win this book because I make Christmas presents for my students and I have several pieces of wool that I have felted and I can see these animals made with it. Even if I do not win, thank you for being so generous, sharing your ideas with other teachers! If we have a crew at Thanksgiving this year, this will be the project we work on. Thank you for sharing all your ideas. I'd love to have this book...I have 13 grandkids under 8; this will be full of ideas for every age level! Myself included! I just discovered your wonderful blog! 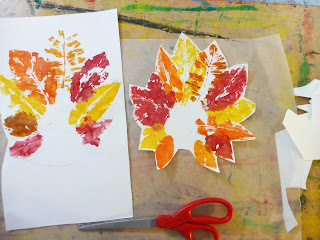 I am a first grade teacher in California and can't wait to do the leaf turkeys with my students. We're doing your fall tree next week! I love your projects! Gail, thank you so much for your wonderful posts and ideas! As a home schooling mom your blog has become one of my favorite resources!! 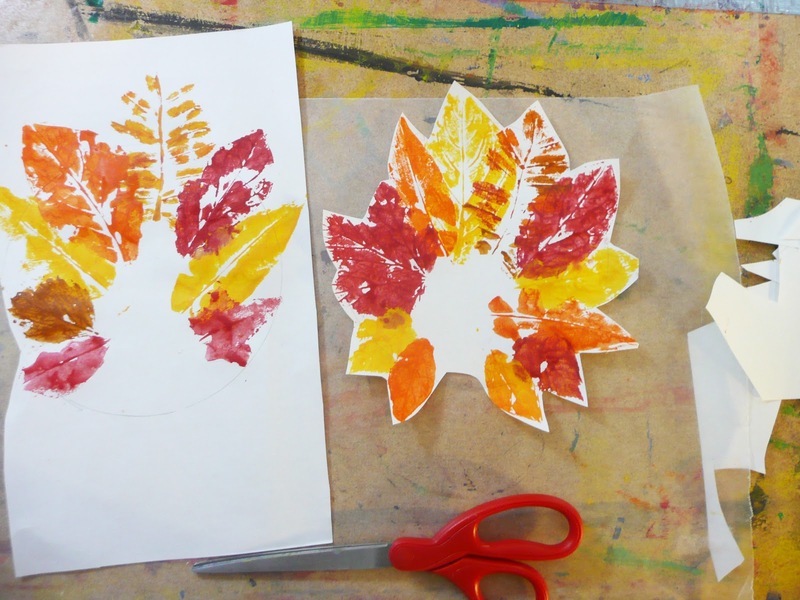 Love the leaf prints! And squirrels are my favorite! Thanks for sharing the great ideas. I know the kids will enjoy them too. Thanks for all you do! I work with kids in an After-School Program (ages 4-12). We would love the book on creating stuffies! Those are really adorable stuffed animals. Please enter me in the drawing for the wonderful book. I would also like more hours in my day :) Thank you for the chance to win and for your lovely blog! What a beautiful book and a wonderful project! 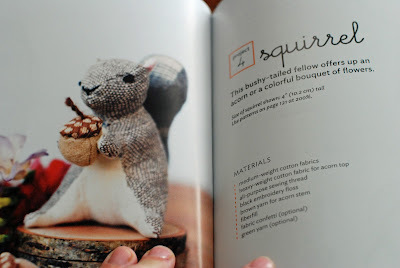 Yours is something our whole family can do, and my daughter and I would have so much fun sewing stuffies together for our nature table and her little brothers! Oh gosh i LOVE the look of this book!! would love to win! 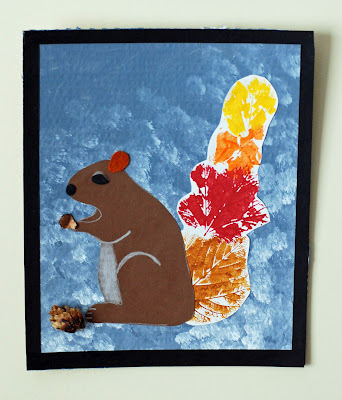 I have been looking for a squirrel stuffed animal pattern!! How fun, a whole book of softies! Yes, please throw my name in the hat as well! Thank you. 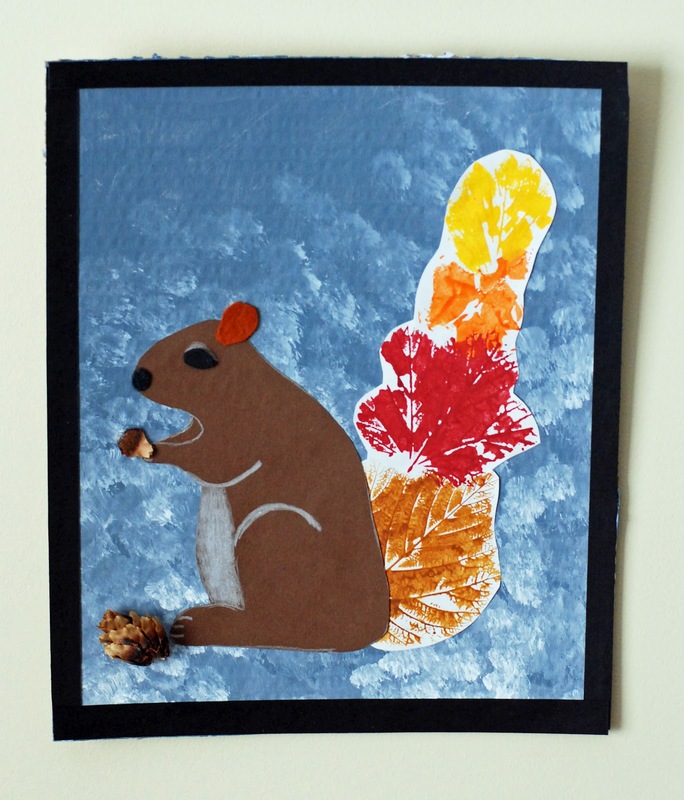 Love the squirrel art--might use that one this week after our leaf hunting walk. 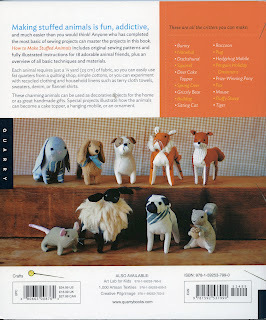 The book looks awesome--My children enjoy making homemade puppets and "lovies" with me, so we would certainly enjoy it. Thanks for doing such a great giveaway! 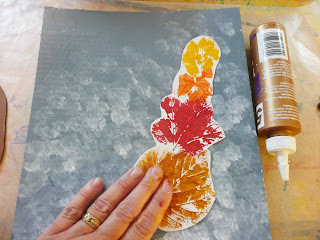 Oh, I'd forgotten all about leaf prints! My girls will definitely enjoy doing some. I have 'Pin'ned many of your ideas on my ArtLessons Pinboard and tried with my students. Thank you! So cute and creative! 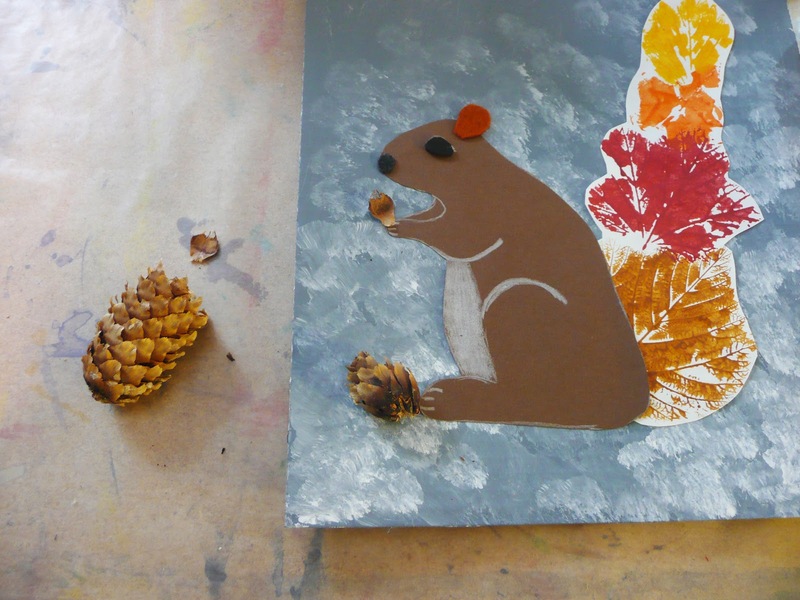 Can't wait to take a walk to gather leaves and then make these adorable animals with my boys. 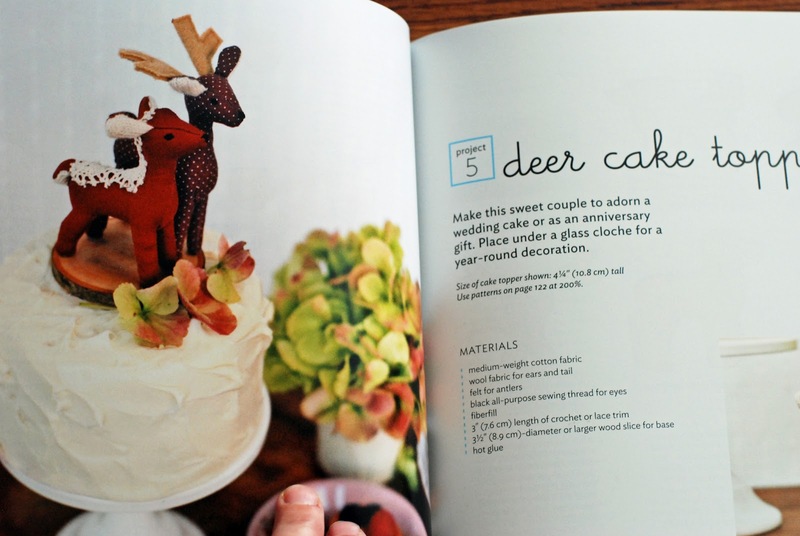 The book looks like so much fun - lots of great ideas to try. I would love to make stuffed animals for the grandchildren. 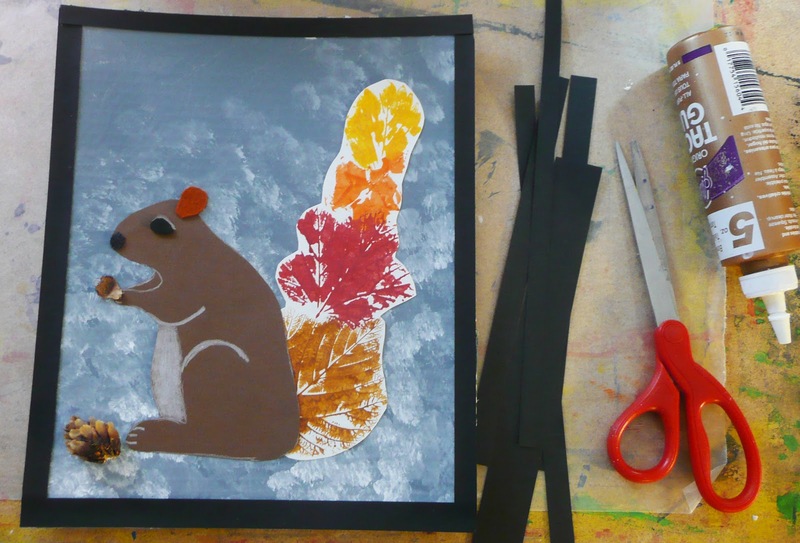 What an amazing website for kid art! Yes, I would love to have this book, count me in! Love to win the book! Thanks for offering a giveaway!